Artteck Gallery is professional software designed for art galleries, placing at your fingertips a database of images, mats and moldings–as well as a full accounting package! The user can create, change and view powerful designs with the click of a mouse. It helps galleries close many deals otherwise lost due to customers not being able to visualize what the final product will look like fully framed in their home or office. This high-tech tool will take your gallery full-speed into the 21st century. It will save you countless hours of looking for the perfect image, and then its complimentary mat and frame. It filters your search through multiple criteria to include molding, distributors, publishers, size, color, themes, artist, subject, shapes, et cetera. It finally puts you in control of what you need to accomplish. It will generate your invoices, as well as track your inventory and sources of materials, and serve as a reminder for ordering products to complete your sales. This dynamic software package will continuously be working for you, promoting, displaying, and attracting new and repeat customers. It will display and feature any promotions and new designs in a powerful slide show format that adds sales and new customers to your bottom line. All of this for less than a cup of coffee a day. Artteck Gallery will give your company the most professional and high-tech look this industry has ever seen–thereby setting you apart from the competition. Install your free demo and experience all these exiting benefits today. Virtual matting and framing on your computer. Create, change and view new designs in seconds. Compare and view multiple designs for best selection. Professional training tool for your employees. 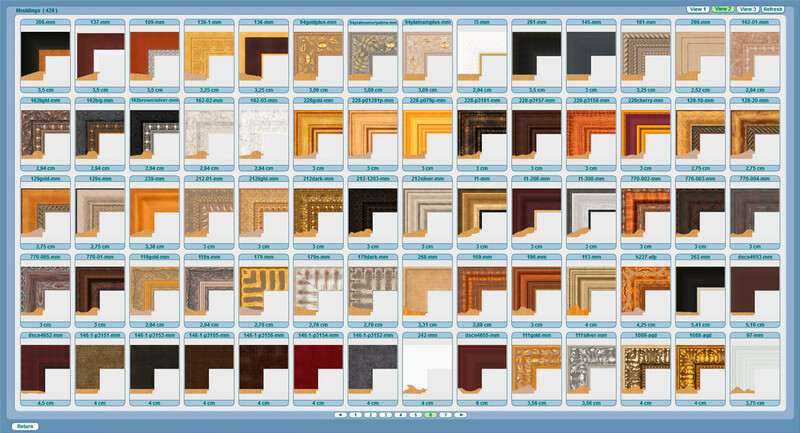 Databank of images and moldings at your fingertips. A living software continuously updating colors, trend and pricing. Select an image, mat it & frame it on your computer. Instantly capture your customer’s artwork. Ability to import your own images. Customer is able to view complete designs. Locate an image or a moulding in seconds. Eliminate objections and fears for buyers. Built in dynamite marketing tools. Email your customer a design with a click of a mouse. Expand your inventory a thousand fold. Compare multiple designs side by side. Generate mailing lists for target marketing. Create a high-tech image for your business. Easy to increase sales with add on . Help you close more sales. Stay with cutting edge technology. User friendly and easy to learn. Attach designs to invoices and work orders. Tracks invoices, sales and work orders. Reminds you of all items to purchase. Run reports of all types. Keeps you focused on the sale. A living software continuously updating colors, trends and pricing.